Last night in Mbizana, Eastern Cape, unknown attackers impersonating police officers assassinated the activist and chairperson of the Amadiba Crisis Committee at his home, in front of his young child. Sikhosiphi Bazooka Rhadebe from Mdatya village in Amadiba died on the scene after reportedly being shot in the head eight times. Under Rhadebe’s leadership, the Amadiba Crisis Committee has been resisting proposed mineral sands mining at Xolobeni on the Wild Coast by a subsidiary of Australian mining company Mineral Commodities Limited (MRC), including through legal action. There has been a long and well-documented history of conflict around this proposed development, not least because of the inability or unwillingness of the Minister and Department of Mineral Resources to intervene and listen to the concerns of affected people. We, the undersigned organisations, are shocked by this brazen act of retribution against Mr Rhadebe, and extremely concerned for the safety of other activists of the Amadiba Crisis Committee. We are also alarmed by the trend of violent intimidation of civil society engaged in advancing human rights and environmental justice, fighting corruption and protecting the Rule of Law. Just yesterday, 18 non-government organisations issued a statement condemning the “military style raid” conducted on the Helen Suzman Foundation (HSF) offices in Parktown, Johannesburg over the weekend. We expressed profound concern about what we regard as a context of increasing hostility by some within the state towards civil society. We recognise that this kind of action is part of an international trend. A 2014 investigation by Global Witness revealed there were nearly three times as many deaths of people protecting land and environmental rights in 2012 than 10 years previously. In the past few weeks, two prominent environmental activists fighting for the rights of indigenous people, Berta Cáceres and Nelson García, were murdered by unknown assailants in Honduras. Immediate protection of all Amadiba Crisis Committee activists from similar attacks. Urgent investigation by the Independent Police Investigative Directorate (IPID) into allegations of intimidation by SAPS preceding last night’s tragic events. The statement by the Amadiba Crisis Committee is reproduced at the end of this statement. MRC is also the owner of the Tormin mineral sands mine on the West Coast, which has been the scene of more violent confrontation between the mine and workers, and has been accused of violation of numerous environmental laws. We are shocked to tell the public that the chairman of Amadiba Crisis Committee, Sikhosiphi Bazooka Rhadebe from Mdatya village in Amadiba, was brutally assassinated tonight outside his house in Lurholweni township, Amadiba area, Mbizana. Our beloved Bazooka made the ultimate sacrifice defending our ancestral land of Amadiba on the Wild Coast. He was murdered at about 7.30 in the evening. The hitmen came in a white Polo with a rotating blue lamp on the roof. Two men knocked at the door saying they were the police. Mr Rhadebe was shot with 8 bullets in the head. He died defending his young son, who witnessed the murder. His son and his wife are now in hospital. After one year of threats and attacks, we have been waiting for something like this to happen: Ever since the shootings in Xolobeni 3 May last year, led by mining director Zamile Qunya, and ever since the Christmas shootings in Mdatya village. But since the four gangsters from the Christmas shootings were released on bail in January, police have been intimidating the Amadiba community and leaders in nightly raids, determined to look in the wrong direction. 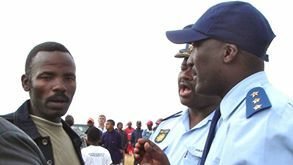 For one year the local police has refused to cooperate with the Umgungundlovu traditional authority of the coastal Amadiba area to stop the violence against our community which says no to mining. The Amadiba coastal community will not be intimidated into submission. We appeal to democratic South Africans to support our community and stand by us in this terrible moment. The Umgungundlovu Traditional Authority and the ACC are represented by Richard Spoor Inc. in Johannesburg and LRC in Cape Town and Pietermaritzburg. For legal issues in the coastal Amadiba community struggle against mining: Henk Smith 0832661770, Thabiso Mbhense 0711099340 and Richard Spoor 0836271722. While a mining right was awarded in 2008, this right was suspended four months later and withdrawn in 2011 after residents lodged an appeal. A new application for a mining right was filed by MRC’s local subsidiary with the Department of Mineral Resources on 3 March 2015, and members of the Umgungundlovu community have approached the High Court interdicting the Minister of Mineral Resources from awarding the mining right until copies of the application have been made available to the community for consultation. Should the project go ahead, the mining would reportedly displace more than 200 households. The Umgungundlovu Traditional Authority and the Amadiba Crisis Commitee are represented by attorneys Richard Spoor Inc. in Johannesburg and the Legal Resources Centre in Cape Town and Pietermaritzburg. The attack on Rhadebe and the Amadiba Crisis Commitee is not an isolated incident. Last week, the Mpukunyoni community members in KwaZulu-Natal marched to the Mpukunyoni Traditional Council offices in protest against the fact that the Somkhele Coal Mine (operated by Petmin’s wholly-owned subsidiary Tendele Coal Mining and their traditional leadership) provides no benefits to the community, but the community has to bear all the negative environmental impacts on their water, arable land and grazing fields for their livestock caused by the mining operations. That evening, attackers entered the compound of Bongani Pearce, Chairman of the Mpukunyoni Community Property Association and fired gun shots. Pearce found the community office with broken windows and his truck ablaze.